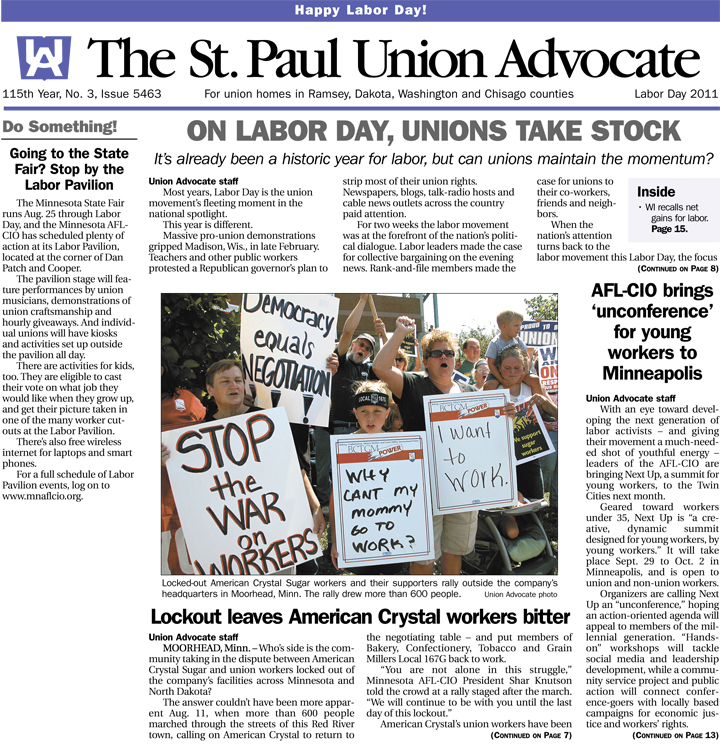 The Union Advocate is the official publication of the Saint Paul Regional Labor Federation, AFL-CIO. With more than 100 affiliate unions, the Regional Labor Federation unites more about 50,000 union members who live or work in Ramsey, Washington, Dakota and Chisago counties. The Regional Labor Federation supports local political, organizing and issue-oriented campaigns by mobilizing its network of committed union volunteers, and The Union Advocate newspaper is an important outreach component of those campaigns. The Union Advocate is mailed to members of unions affiliated with the Regional Labor Federation, and is supported through per capita payments from those affiliated unions. The Advocate is published 10 times per year and mailed directly into union members’ homes and union offices across the Twin Cities. Published continuously since 1897, The Union Advocate has long has been recognized as one of the leading labor publications of its kind. The Advocate is a member publication of the International Labor Communications Association. The Union Advocate’s editorial content is overseen by a three-member Editorial Board. Current board members are Nancy Goldman of UNITE HERE Local 17, Jon Grebner of AFSCME Council 5 and Bob Ryan of Steelworkers Local 264. Michael Moore, a member of the Minnesota Newspaper Guild Typographical Union/CWA Local 37002, is the current editor of The Union Advocate, a position he has held since June 2006. Contact him with news tips, letters to the editor, advertising inquiries or anything else by e-mailing mmoore [at] stpaulunions [dot] org, or by calling 651-222-3787, extension 112.